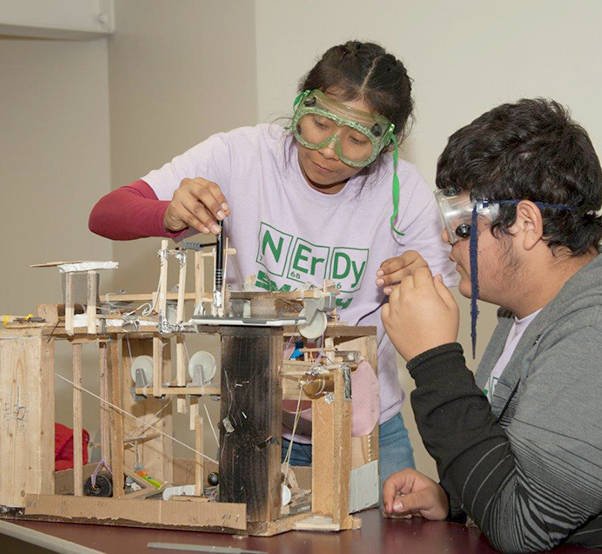 Nelly Torres and Adrian Valenzuela from Francisco Bravo Medical Magnet High School in East LA participate in “Mission Possible and set up their Rube Goldberg experiment during the 32nd Annual Los Angeles County Science Olympiad at the Antelope Valley College. Antelope Valley College hosted the 32nd Annual Los Angeles County Science Olympiad Feb. 17. During the Olympiad, students took part in numerous events including team problem solving, technical writing, building airplanes and other scientific contraptions. Science Olympiad is a national STEM competition for middle and high school students where they compete in events pertaining to various scientific disciplines, including earth science, biology, chemistry, physics and engineering. Each state hosts regional tournaments and the winners participate in a statewide event. The top 120 teams will advance to the 34th Annual Science Olympiad National Tournament which will be May 18-19 at Colorado State University in Fort Collins, Colo.
Nelly Torres, 16, from Francisco Bravo Medical Magnet High School never even considered participating in a STEM event. Coming from a low-income neighborhood in East Los Angeles, she said she has attended schools that didn’t really support her until she transferred to Francisco Bravo Medical Magnet High School. “Mister Morgan, my chemistry teacher, inspired and believed in me. He showed me that if I try hard enough for something I have never tried, I could do it — and here I am!” she proudly explained. 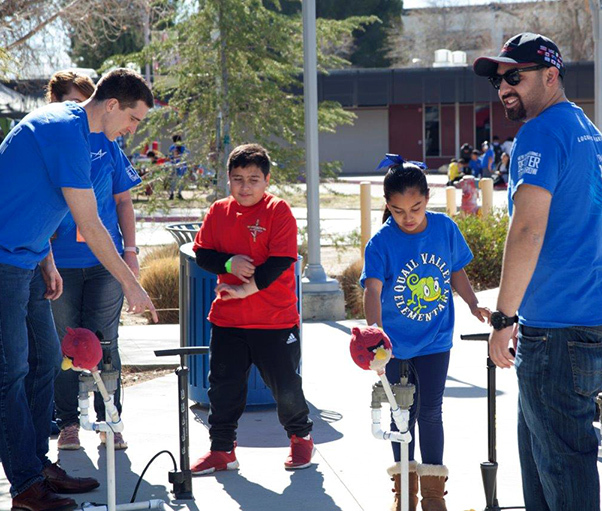 Lockheed Martin employees volunteer during the 32nd Annual Los Angeles County Science Olympiad, encouraging students to pursue STEM education. Nearly 2,000 students will participate at the 34th Annual National Competition in May at Colorado State University in Fort Collins, Colo. The teams advancing to the National Finals will be determined at the State Finals that will be held at Caltech April 7. For more information visit www.soinc.org.